It’s been a very promising week, despite the cold. 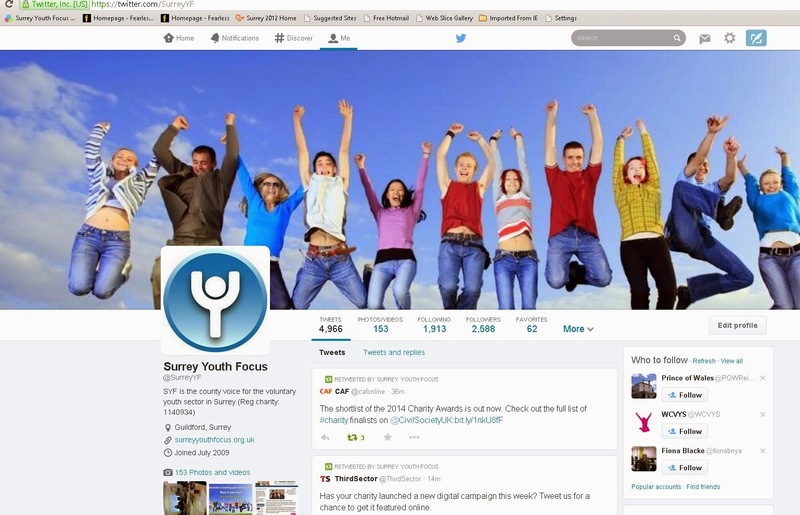 The Young Surrey – Strategic Review 2012-13 has attracted a lot of very positive comment, and has I think achieved the objective of underpinning Surrey Youth Focus’ leadership role with an evidence base. The free workshop (24 Jan) for young people interested in self-employment/ setting up in business (see website) is gradually attracting participants – it takes a while to get out there. It takes a considerable cultural shift for youth workers to see that part of their role in future must surely be to encourage/enable young people into what some call the enterprise economy. I have also agreed with Surrey CC that they will organise a workshop for youth workers on Social Enterprise next year, as they are receiving so many approaches about it. Meanwhile, I have been meeting with a funding organisation that can provide cheap loans to young people wanting to fund a business start-up. We have also been working on a proposal to create a virtual network between community organisations, university, local authorities and business which we’ll be launching early in the New Year – very exciting and innovative – the idea of one of our Trustees. We’re meeting in the New Year with Unity UK a major insurance company with whom to do a deal for Members about discounted insurance rates for youth clubs/activities. Also met with Surrey CC this week to discuss the future of the Small Grants Scheme which we may possibly be undertaking to run for SCC in 2013/14, which we would welcome, and do well. Christmas Reflections to follow next week..enjoy the shopping??!! Obviously, I have to start with the great England win over the All Blacks last Saturday at Twickenham, which I had hinted at in last week’s blog by saying that I thought England were learning/ improving. Perseverance and leadership – for the England captain Chris Robshaw may not be a 7 (open side flanker), but he is a leader. There must be a management/ leadership case study there. My cautious optimism is not dented by the Autumn Statement, though it should be noted that local authorities will be facing more cuts, and whilst housing benefits have not been withdrawn from young people, it is very clear that there will be continued pressure on welfare benefits. It was right to have warned in the “Young Surrey –strategic review” of the continuation of the austerity beyond 2015, and that we should all look to other funding sources, which in practice means trading/social enterprise, and linking to corporates /business. The self– interest and sheer gall of some corporates is reflected in the Starbucks episode – the next Ratners?- and by the findings of the Treasury Select C’tee who are doing a great job in unmasking the duplicities of corporate tax avoidance. As if to demonstrate an alignment of theory into practice, our long awaited Surrey Youth Enterprise CiC has now been registered at Companies House and we can now move to get premises, recruit staff (unemployed young people) and get trading. The first Surrey Youth Enterprise workshops for young people(aged 16-24) wanting to learn about How To set up in self- employment/social enterprise is set for 24 January and we look forward to working with up to 15 young entrepreneurs. Details are on our website – to book just contact Kate Peters . I met with a funder this week who will offer young people start up loans from £500- £5,000 at 6%. Meanwhile, our thinking about a business network is proceeding apace and will be put to Trustees in early January. We are also considering developing closer links to The Youth Consortium, and again more about that later. Our Member benefits continue to grow as part of our offer to members and we are now in talks with an insurance company that will provide a discounted insurance offer to all our member organisations. Telephone interview with NCVO consultant this week about our bid for consultancy support under the Lottery’s “Big Assist" programme to support infrastructure organisations like us in relation to the really interesting initiatives we’re making. We will hear in January if we are successful. Decision on Armed Forces community covenant bid next week…..
And finally ..just checking you all got the tribute in the title to the Rolling Stones (50th anniversary) who are, remarkably, even older than me..though Mick and I were both at the LSE ..enough!